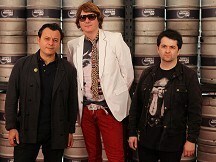 Manic Street Preachers have given cash to an appeal for families of four miners killed in the Swansea Valley. Neath MP Peter Hain, who helped set up the fund, said on Twitter that the Manics phoned him to pledge a "substantial donation". He added a "mass of donations" at his Neath office had taken the total to more than £100,000. Earlier this week, the UK Government agreed to pay the equivalent of Gift Aid - which will add 25% to all donations. Money from the appeal will be given to the families by the South Wales branch of the National Union of Mineworkers, which helped create the fund. Phillip Hill, 45, Garry Jenkins, 39, David Powell, 50, and Charles Breslin, 62, died after they became trapped in the flooded Gleision Colliery at Cilybebyll, near Pontardawe, last Thursday. Three other miners escaped, one of whom was taken to Morriston Hospital in Swansea. Sir Paul McCartney has revealed he was inspired to try out his own ballet moves as he researched his new dance project - but proved a dismal failure. Shaun Ryder has told how he had to ask his friends for help writing his autobiography - because he couldn't remember anything. Grammy-winning rock group REM have announced on their website that they have "decided to call it a day as a band". Coldplay frontman Chris Martin has compared the band's forthcoming album to a musical.Mylo Xyloto comes out next month and is loosely based on a love story.